Black steel and glass presentation TV floor stand (STAND-TV08) from VIVO. 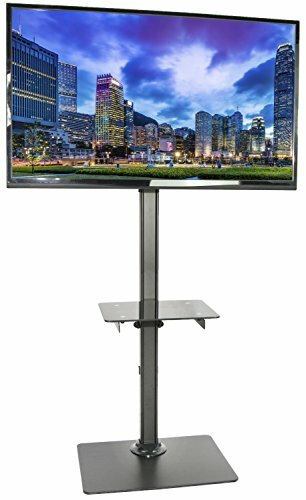 Designed to hold most flat panel LCD screens up to 55" and 55lbs in weight, this elegant yet heavy duty TV mount is perfect for showrooms, offices, home entertainment, and more. The solid steel 15" x 20" base weighs a hefty 25lbs, providing optimal balance for your TV and AV equipment. Rubber non-slip grip pads are included for the bottom side of the base. The 10" x 14" middle glass shelf holds up to 11 lbs and features simple height adjustment allowing the user to set the shelf to desired height. Other features include solid all steel construction, screen tilt for better viewing, and integrated cable management for keeping power and AV cords clean and organized. The mounting bracket is compatible with VESA 75x75, 100x100, 200x100, 200x200, 300x300, 400x200, and 400x400. This stand also fits most computer monitor screens with VESA mounting capability. Instructions and all necessary hardware are included. MIDDLE GLASS SHELF - Height adjustable and rated to hold up to 11 lbs of AV equipment. DESIGN - Boasts a solid all steel construction with a 25lb (15" x 20") base for optimal balance. MOTION - Features include screen tilt for optimal comfortable viewing experience. CABLE MANAGEMENT - Integrated in order to keep potentially messy cords clean and organized.